Ngoppon Together warns that to attempt to assure any community Aboriginal or non- Aboriginal, that the reverse is true is a deprivation of the human rights of such families and their future generations. It is a severe breaking of trust with our obligations to our own country and environment. Our members consider that any attempt of a proposal to place this site on Aboriginal lands in SA will be a blatant disregard for the Custodians of their lands already so long disregarded. These particular Findings of the Royal Commission (including their many subclauses, not included), which note expressly Aboriginal Communities and specifically those communities deeply affected by the British nuclear tests at Maralinga, ring immediate alarm bells for our members. We ask the South Australian government if they intend to act on this recommendation of the Royal Commission’s Tentative Findings- What Duty of Care to its citizens is being exercised? Our members view with deep apprehension the sections Social and Community Consent and Law, Heritage and Respecting Rights particularly #110, #111 and #115 with their many subclauses. We put the following warning to the Commission and consequently to the State Government. No matter how culturally correct are its procedures in dealing with an Aboriginal Community in our state – to succeed in the Commission’s recommendation to establish there, a site for international high-level radioactive waste will be an ultimate betrayal of a Government’s responsibility to their citizens and their future generations. The means fail to justify the end. NB Ngoppon Together calls upon the Commission in its final Report due to be released on May 6 to abandon the ‘framing’ of essential concepts into words which downgrade risks and are therefore likely to be more acceptable to the general public. 1.Our members welcome other sentences of the first part of Para 73 wherein the risks of this extraordinary proposal are named: that is high level radioactive waste is named as ‘highly radioactive and hazardous.’…’for hundreds and thousands of years.’ Also named is the potential for radionuclides to migrate. Over this extraordinary time frame we suggest the omission of the word ‘potential’. It is certain. 2. ‘That hazard diminishes over time. Within 500 years…’ We question the almost facile dismissal of enormous time frames. 500 years is more than twice as long as white occupation in Australia and yet it is seemingly dismissed here as a short time. We don’t know what Australia’s political, or environmental situation will be over that period of time. 74. There is international consensus that geological disposal is the best technical solution for the disposal of used fuel. Two countries, Finland and Sweden, have successfully developed long-term domestic solutions. That success has been both in gaining social consent for a facility and in developing an engineering and technical solution that has been licensed to safely provide for disposal over a long period. The more advanced of the two projects will start receiving used fuel early in the next decade. We note that in this finding the Commission actually admits that the engineering barriers will break down. Our members again question the ‘confidence’ with which SA’s nuclear Royal Commission seems to approach this whole extraordinary scheme. High-level radioactive waste which the Commission is recommending to actually import into our state and country keeps toxicity for an incredible 300,000 years. We put it to the Commission and to the SA Government who seem to be disposed and content to accept the findings as a last word on this frightening proposal that reasonable predictions of such future behaviour have been made from careful study of the particular geological formations over much longer periods in the past. Each of the underlined words (our emphases) represents easy assumptions which are ingenuous at best and deceptive at worst. Here is an admission by the Commission that the radionuclides will eventually reach groundwaters. For us South Australians there is overwhelming, sadly, local evidence of the complete inability of technology to contain risks and even in contemporary times to decontaminate. Our members draw attention to a completely relevant example of such failure to dispose of highlevel waste in our own country; in fact in our own state. That is, the dangerous material was placed exactly as it had been before this extremely expensive and much vaunted exercise! And then- the operators were actually lauded as proponents of ‘world’s best practice’! There is no container whether it is steel, concrete, titanium etc that will last for over one hundred years, so the notion of storing radioactive waste isolated from the ecosphere for one million years is pure fantasy. Doctor Helen Caldicott July 2015. 85.There is no existing market to ascertain the price a customer may be willing to pay for the permanent disposal of used fuel . b. a separately located, secure, underground repository facility comprising a series of tunnels into which specially designed canisters containing used fuel and intermediate level waste are deposited for permanent disposal. Our members consider that any attempt of a proposal to place this site on Aboriginal lands in SA will be a blatant disregard for the Custodians of their lands already so long disregarded. Yet since settlement, mainstream Australians have relied on their original care of the land – and continue to reap these benefits. 112. The Commission has received many submissions that underscore the deep connection that Aboriginal people have with the land and their responsibility for its care. That strong relationship with land is central to the way that Aboriginal South Australians have considered projects, including proposed nuclear activities. It is critical that a proponent of any nuclear project understands and respects that connection. We remind the Commission and consequently SA Government that to acknowledge the disastrous effects that the atomic weapons testing at Maralinga in SA in the 1950s and 1960s has had on Aboriginal Communities and non Aboriginal South Australians is one thing. Then to fail to learn from these experiences and to go ahead with this proposed project of importing high-level nuclear waste into our South Australia project is worse than foolish. Not to learn from our history is indeed to risk repeating it. that there are simply NO World’s Best practice for the storage of nuclear high-level waste. The material is simply too dangerous, will live on dangerously for an outrageous 100,000 – to 300,000 years. Despite the fervent hopes of the nuclear industry/lobby– there are no technological solutions to its safe storage – now or likely to be in the foreseeable future and quite foreseeably, never. Ngoppon Together gives warning of the following: ‘The weight of scientific opinion holds that there is no threshold below which ionising radiation poses no risk of inducing fatal cancers. Radiation protection agencies around the world including the Australian Radiation Protection and Nuclear Safety Agency (ARPANSA), all base regulations on the linear no-threshold model which assumes there is no threshold below which radiation exposure is safe. (our emphasis) Friends of the Earth ‘Ionising Radiation and Cancer.’ Jan 2013 . Every Australian and every South Australian is surely wanting to create a world which is safe for their grandchildren’s health. Eileen Wani Wingfield, Kokatha Elder spent most of her adult life opposing different forms of the nuclear cycle because of her early experiences with fallout; the Black Mist bomb from Emu in 1953. ‘I’ve been fighting Roxby since the start. We don’t want the dump because we’ve seen what happened to our children (from the bomb). Everyone was sick. I’ve got a grandchild, he’s got a tumour in his head. Why do they do this to the innocent? EWW, Coober Pedy September 2003. 112. Ngoppon Together notes with alarm the quite dismissive manner in which the Fukushima disaster is noted by the Commission’s Findings. Our members are concerned that in the Findings in this section the Royal Commission make no mention at all of transport accidents which occur world wide. There have been a number of spills in Australia already in connection with the transport of radioactive waste. Advocates who claim there is no danger are simply flying in the face of the reality of the real world. The NSW Parliamentary Inquiry into radioactive waste found there “is no doubt that the transportation of radioactive waste increases the risk of accident or incident – including some form of terrorist intervention”. ANSTO has acknowledged that there are 1-2 accidents or ‘incidents’ every year involving the transportation of radioactive materials to and from the Lucas Heights reactor plant. Ngoppon Together asks: What kind of resources do individual Councils have throughout Australia to deal with the probability of a crash involving particularly intermediate or high level waste? 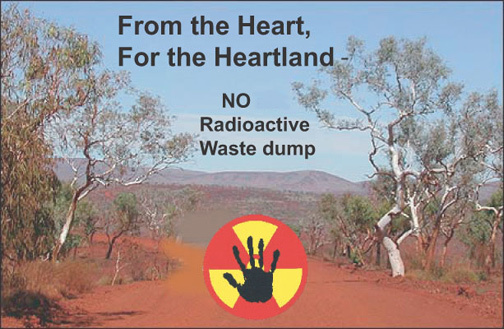 Aboriginal people oppose digging up uranium on their land in the first place and then to compound the burden, in the past at least are faced with the waste being imposed on them and their lands, waste that is up to one million times more reactive after enrichment. Ngoppon Together warns that people are going to get sick. And that it’s not as if we haven’t got alternatives: the positive alternative is still possible. South Australia presently is the leading state in renewable energy (40%) and has the opportunity, if taken by government, to go down this positive healthy path to maintain a clean, safe country and waters, safe and healthy employment opportunities and ensure the safety, health and well being of all of its citizens. Our members plead with Commissioner Scarce and the members of the Royal Commission, with Premier Weatherill and all Members of Parliament and Members of the Legislative Assembly: for the sake of our common humanity abandon all thoughts of this scheme. As fellow South Australians, Australians and as fellow human beings together, the implications and consequences of importing the world’s radioactive waste in its highly toxic form is indeed terrifying; and, it must be said, a totally irresponsible legacy, for our generation to leave to the grandchildren, great grand children and every generation to come in our state of South Australia…….Michele Madigan for Ngoppon Together Inc.